"I'm in Poland, and Waco is burning"
The siege and fire in Waco, Texas, that killed 75 people (including 25 children) happened this week in 1993, a controversial operation during which US Federal agents raided the sprawling compound populated by Branch Davidian Christian followers who were suspected of illegally stockpiling weapons. In exclusive Miller Center interviews, President Clinton’s White House counsel Bernard Nussbaum paints a picture of what was happening behind the scenes, as the government was roundly criticized for mishandling the situation. With the benefit of 20/20 hindsight, Nussbaum reveals that he later came to question the advice he gave President Clinton, as well as what he told Attorney General Janet Reno, who took the fall for authorizing the FBI raid in the first place. 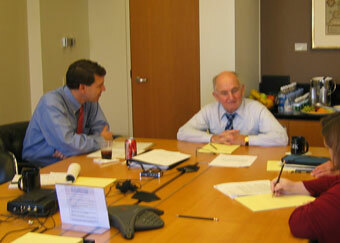 The Miller Center's Russell Riley (left) interviews Clinton's former White House counsel Bernard Nussbaum. I don’t feel the same way now about the FBI or the Secret Service or anything that I did then. I really came in with a high opinion of them at the time; my opinion is now somewhat less. Don’t overstate it. It’s a little bit like the Bay of Pigs, relying on the CIA. This advice that I’m giving now, it’s logical and sensible, but somehow I’m sorry about it in retrospect. But ultimately it’s your call. I called the Attorney General and told her, “Before you do anything, talk to the FBI,” like I said, but my suggestion is you call Colin Powell, and that’s what they did. Colin Powell is the most Teflon person in the world. None of this came up. Before they went into Waco, Powell or some of his people reviewed the plans and said they basically made sense. We were involved. We didn’t know when they were going to go in or if they were going to go in, because I kept the President out of it. I gave her the advice of relying on the FBI, which she then did. They came and told her there were children inside. I then went on a trip with the Vice President to Poland. He spoke on the anniversary of the Warsaw ghetto and I was invited to go with him. I flew on Air Force Two. We got to Warsaw. It was night, we got off, we were in cars, taken to our hotels, and changed clothes to go hear this great speech. I walk into the hotel and I turn on the TV, they’re just starting the international news and there’s Waco burning on the TV set. I’m in Poland, and Waco is burning. I call the office. I don’t know if I talked to Foster or somebody else. “What’s going on?” They said, “What’s going on is what you see on TV. What’s going on is they broke in and fire started and a lot of people are dead. But we’re handling it. We and George Stephanopoulos.” And then they kept the President from making a statement for 24 hours, which was also a mistake. I wasn’t involved in that because I was in Poland at the time. I don’t know what position I would have taken. Maybe I would have taken the same position they took. I was trying to keep him out of it too. The whole thing was a mistake. You couldn’t really keep him out of it. He shouldn’t have been kept out of it. I’m sort of sorry—I gave the advice I thought was right. Maybe it’s still sort of right. You can always second guess yourself. So it was compounded. Once it came, then he didn’t come out for a while. Then Stephanopoulos made a statement, basically taking the position I took. This is the Attorney General. Go talk to the Attorney General. It wasn’t right. You’re the President, you’ve got to come out and say something. I don’t know if I would have seen that at the time. Certainly I didn’t see it when I was giving him my advice. You’re the President, you’ve got to come out and say something. I don’t know if I would have seen that at the time. Certainly I didn’t see it when I was giving him my advice. Of course Reno then saved herself. She went on TV. She took responsibility, she went on Nightline. She made the decision. She didn’t blame the FBI. The reason she made the decision was this. She’s sad with what happened, but she was the one—and she became a heroine because she took responsibility and didn’t run away and didn’t hide or anything like that. And Clinton, both by virtue of what happened, and also by virtue of not really speaking out at that time, coming out forcefully, having been kept by the White House, sort of following the line that I created, although I don’t know if they were deliberately doing that, ended up being hurt by Waco. It was a great tragedy. [Janet Reno] became a heroine because she took responsibility and didn’t run away and didn’t hide. Clinton, both by virtue of what happened, and also by virtue of not really speaking out at that time, coming out forcefully…ended up being hurt by Waco. It was a great tragedy. In retrospect, obviously, when Clinton met Louis Freeh later on, he asked him about Waco, and one of the things Freeh said that was a mistake going in, the FBI made a mistake in their advice. They really should have waited and waited and waited and tried to starve them out. Yes, it’s easy to say in retrospect. And it’s fully correct in retrospect. It’s likely Freeh said that because he was very upset about the Waco thing. I don’t know what he felt. He was upset he got hurt by it. He never said to me that he was angry at the advice I gave him when I made him stay out of it. But I don’t think he thought it was good advice I gave him in the final analysis, although I’m not sure what he would have done if I gave him any other advice. Q: Did they feel like the Attorney General managed the fallout from this well, or was there a kind of internal jealousy that she—? Nussbaum: My recollection is that they were pleased. I mean we had just lost an Attorney General, Zoë Baird…. So we were pleased that Reno did not fall at that point and we’d have to go find another Attorney General. There was no jealousy of Reno. They were pleased. They were a little upset that the President was taking this hit and really it wasn’t his fault. But that’s what happens when you’re President. It wasn’t his fault. He didn’t make the decision to go in; he didn’t make the decision to stay out. He was kept out of it by me and maybe by other people also. But we were happy that Reno was strengthened, in effect, solidified and strengthened.